Marla Daily unveiling a monument honoring sea captain George Nidever. 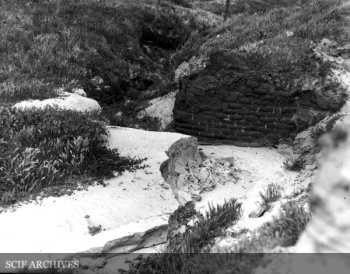 The Santa Cruz Island Foundation placed a headstone on his grave, unmarked for over a century. Sinforosa, his wife, and sons Mark and Ramon, are also in the same plot. The period headstone was designed by the great Santa Barbara stone mason, Osi DaRos. 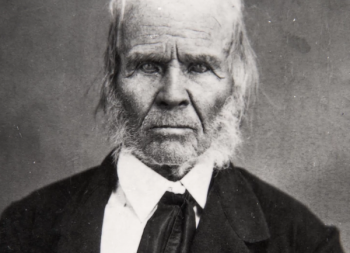 NIDEVER, George (1802-1883), the son of George Nidever (1772-1850) and Christina Funkhouser, was a Tennessee-born frontiersman, mountain man and trapper who came to California with the Walker party in 1834, the first party to cross the Sierra Nevada into California. 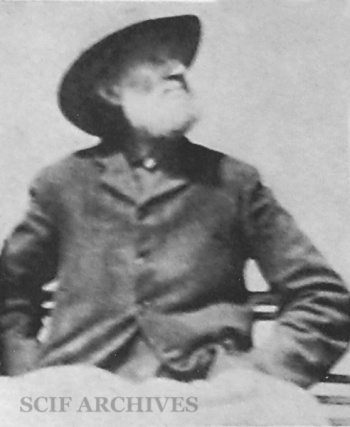 Nidever settled in Santa Barbara to pursue otter hunting, stock raising, and sheep ranching. In 1840 Nidever bought a large conspicuous house on the waterfront on Burton Mound. On January 27, 1842, as an adult, Nidever was baptized at the Santa Barbara Mission, and shortly thereafter, on February 13, 1841, he married María Sinforosa Ramona Sanchez (1812-1892), whose family owned the 14,000 acre Rancho Santa Clara Rio del Norte, and who had grown up among the best of Santa Barbara society. The Nidevers had six children. They lived on Burton Mound for about ten years, until they sold the property in 1851. 1. Marcos “Mark” Ramon Nidever (1842-1909) No indication he married. 3. Juan Nidever (1846-1846) died at birth August 12. 5. José Ramon Jacobo “Jake” Nidever (1849-1913) drowned on New Years Day 1913. In 1850 or 1851, Samuel Bruce sold his right, title and interest in San Miguel Island to Captain George Nidever. 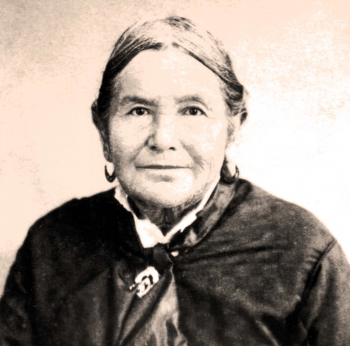 In 1853 when it was discovered the now legendary “lone woman” had been left on San Nicolas Island, Nidever sailed to the island on an otter hunting expedition, located the woman, and brought her back to his home in Santa Barbara in September 1853. In December 1853 Nidever rescued some of the stranded passengers from the wreck of the Winfield Scott on Anacapa aboard his fishing boat Cora. On June 30, 1863 Captain Nidever purchased interest in San Miguel Island from Samuel C. Bruce at a Santa Barbara County Sheriff’s sale. Bruce needed to pay $1486.57 in debts at the time, and Nidever was the highest bidder at $1800 for “all the right, title, interest and ownership... in and to all the sheep, cattle, and horses upon the said Island of San Miguel, consisting of 6000 sheep, more or less, 125 head of cattle, more or less, and 25 horses. Also the right, title, interest, claim and ownership... consisting of a possessory claim to an undivided half of the said island.” Nidever built an adobe 400 feet above Cuyler's Harbor. 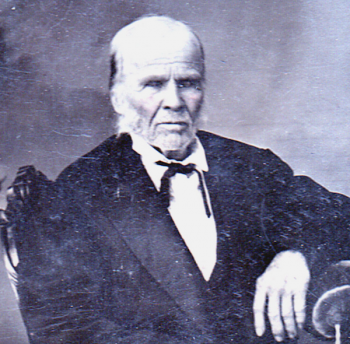 Additional Nidevers in Santa Barbara are descendents of George’s older brother, John Marion Nidever (1797-1873), who also came to Santa Barbara. San Nicolas Island. Terry’s collections ended up in the American Museum of Natural History, New York. Pioneer otter hunter George Nidever died March 27, 1883. His wife, Sinforosa, died in 1892. They were originally buried elsewhere, probably in the old Santa Barbara Catholic Cemetery (Cieneguitas), but in 1912 George and Sinforosa were moved to unmarked graves in a family plot in Santa Barbara at Calvary Cemetery. Children Marcos, George Edward, Jacob, and Isabel Tomasa are buried in Calvary Cemetery as well. In 1878 Nidever dictated his life story to Edward F. Murray, assistant of historian Hubert H. Bancroft. The manuscript was edited in 1937 by William H. Ellison. Nidever's grave was located, unmarked, in Calvary Cemetery, Santa Barbara in 2008. 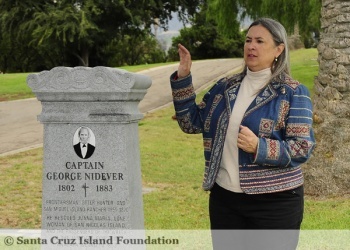 The Santa Cruz Island Foundation raised the funds to have an upright headstone placed on the grave that commorates not only George Nidever, but also his wife Sinforosa, and two sons, Mark and Jacob, also buried in the plot. 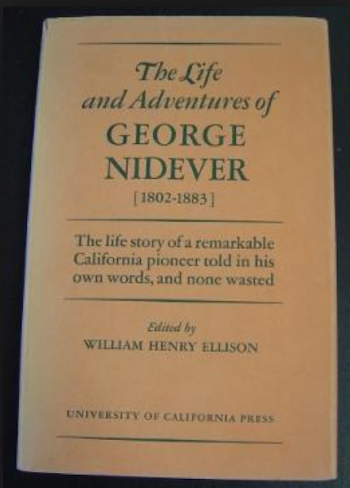 » Ellison, William Henry The Life and Adventures of George Nidever, 1802-1883 Berkeley, U.C. Press, 1937. Now the tale will tell. As any you should see. The hunter's meal to share. To help with right good will. Right down the narrow dell. He sent his only ball. And met him face to face. I say unarmed he stood. Could stand no more than straws. Then came with slackening pace. And gazed with wondering eye. I rather guess than tell. The depths of a brave heart. February 10, 1869 [SBP]: “Died in Santa Barbara February 21, Refugio Nidever, aged 25 years.” [María del Refugio Francisca (1844-1869), second child of George Nidever]. This page was last edited on 6 April 2018, at 19:24.